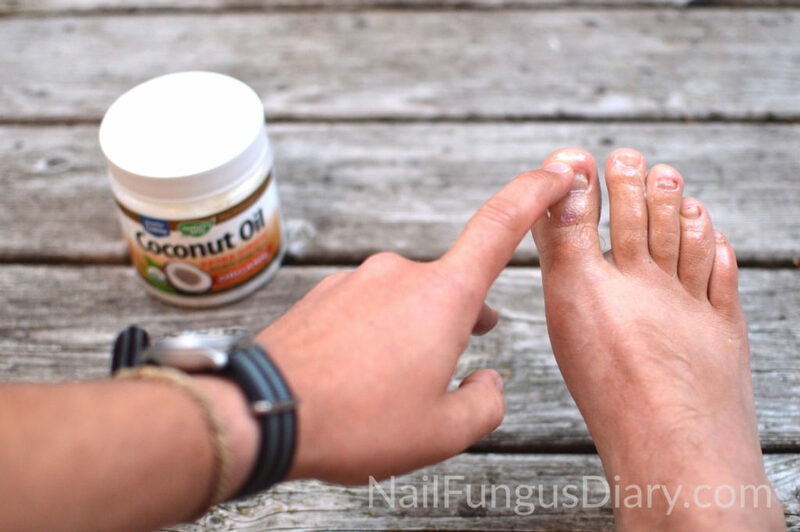 This is a step by step guide showing you exactly what I do each day to treat my nail fungus. I can’t imagine why it wouldn’t work for you just like it’s working for me, but you have to be consistent. So don’t get all excited and do it for a week, then give up when your nails aren’t healed by then. But you’re not going to do that, right? Right. Okay good. First, you need to get some tea tree oil. Here’s a huge cheap bottle of good tea tree oil on Amazon. 4 ounces will last about 3 months. In the morning once you are out of the shower and dried off, apply tea tree oil to your toes. I do not use a q-tip for this, because you will throw away a lot of tea tree oil on the q-tip. I just turn the bottle upside down on my finger and dab it on. A smart way would be to use an eye dropper. Make sure it gets on the surface and under the leading edge of the nail. You need coconut oil which is a carrier for the tea tree oil. If you use the tea tree oil by itself, it might cause a rash because it’s pretty strong. Actually, it’s not that strong if you use it once, but you are going to be applying it every day so you are not going to want to skip this step. An added bonus is that coconut oil has been shown to be an anti-fungal as well. Here’s a really good quality virgin coconut oil. It is semisolid at room temperature and will melt on contact. Rub a small amount into your nails and all over and between your toes. You want to make sure that there isn’t any spot on your toes where the tea tree oil is sitting undiluted. Continue getting dressed and go about your day. When you get home from work/school/whatever, take off your socks and shoes and wash your feet. The closed environment of your socks and shoes is your enemy. You need to deny the fungus its chance of gaining further hold on your nails by removing sweat and dead skin cells. I use an (obviously) dedicated toothbrush and give my nails a quick scrub with an antifungal foot soap with tea tree oil. Put on the tea tree oil and coconut oil again as described in step 1 and 2. It doesn’t take that long, I promise. Go barefoot as much as possible. Shoes and socks are the enemy! If you are like me and have had nail fungus as long as I have, this is going to be uncomfortable at first. You have to do it. Shoes and socks are why most people get fungus on their toes and not their fingers. You’ll need to apply 40% urea cream at bedtime. This softens the nail and helps it absorb the tea tree oil and coconut oil better the next day. Put a little bit on the surface of the nail and inside the leading edge. I don’t bother waiting for it to dry, I just put it on and hop in bed. Round up all your socks and wash them in hot water – and continue to do so. It takes hot water to kill the spores, which can reinfect your nails! I bought a UV light gadget that kills the spores in your shoes, and I use it on my shoes about once a week. This one is the knock off of the more expensive version, but it does the same thing. That’s it! I hope it works for you like it has for me. Good luck! PS. I told my friend that I was making this site and he actually wrote a funny song about it. Check it out!